Whether you have heard the 1981 hit song Jenny or seen the 2012 movie For a Good Time, Call, you’re probably familiar with the phrase, “For a good time call…” And you probably know that it is one you likely don’t want your name or number to follow – or maybe you do. A couple of weeks ago as I was walking into City Barbecue, a sign in the window caught my attention. 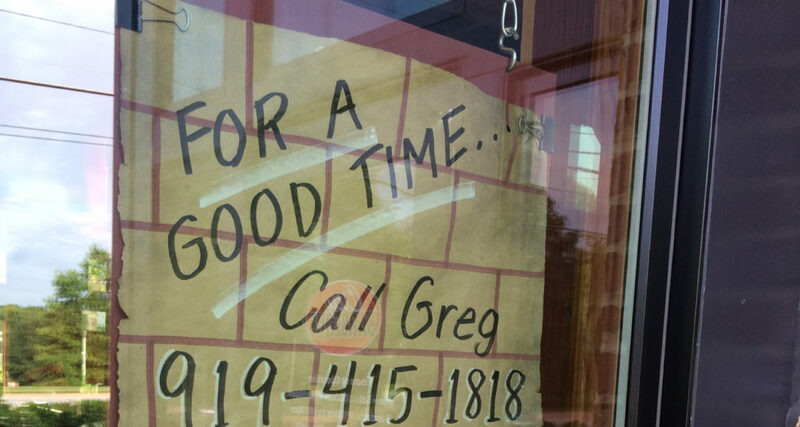 It read, “For a good time call Greg…” and listed a phone number. I continued reading and quickly realized that it was promoting the restaurant’s catering and delivery services, and I couldn’t help but smile. In my opinion, this copy is spot on in regards to conveying its message. Not only does it walk the line between fun and risque, it also uses a catchy phrase that will help people remember the restaurant. I know City Barbecue will be the first establishment that comes to my mind the next time I am in need of a caterer. Where have you seen good copy lately? Share it with us on Twitter!